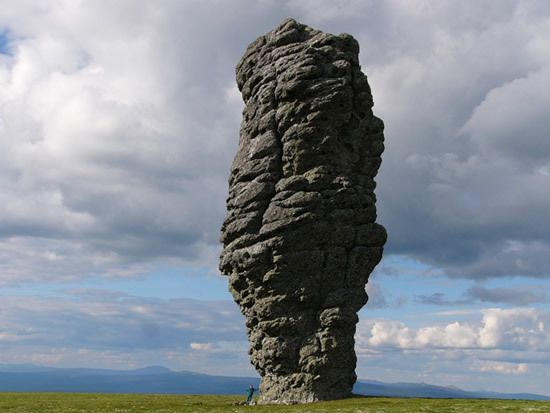 Situated north of the Urals in the Komi Republic of Russia there stands 7 enourmours stone Pillars. They range from 30 to 42 meters high and are a tourist attraction for people of the local area. It is said that they were created through natural processes. Geologists believe that about 200 million years ago they were part of a mountain but as time passed and erosion took it’s course, the soft rock was worn away and we have been left with the amazing stone structures mostly made from shale. Locals believe that the stone pillars were once a group of Samoyed Giants who were walking through the mountains to Siberia in order to destroy the Vogulsky people. When the shaman of the group spied the Vogulsky mountains he dropped his drum and they all turned to stone. Though not man made, I believe the Strong Men are amazing stoneworks in their own right, even though humans have arguably had no hand in their construction.